Urbana University’s Sa’Dera Johnson (3) probes the defense for an opening against Fairmont State on Thursday. 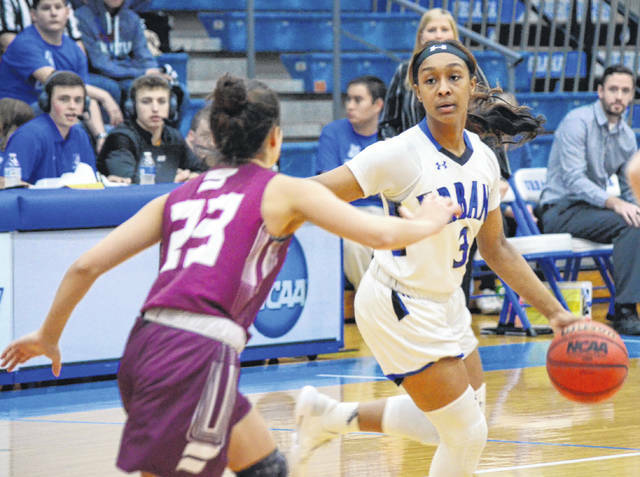 Visiting Fairmont State defeated Urbana University, 75-60, in MEC women’s basketball on Thursday. The Blue Knights led, 39-28, at halftime, but were outscored 29-9 in the third quarter and fell out of contention down the stretch. Sylvia Hudson scored 15 points and had 9 rebounds for UU (2-17, 2-13) with Erin Morrow scoring 13. Sierra Kotchman scored 30 points for Fairmont, with Rachel Laskody adding 20 points and 10 boards. UU hosts Shepherd on Saturday at 2 p.m. In the men’s contest Thursday night, Fairmont State bat UU, 86-74. The Blue Knights trailed, 37-32, at the half. Ethan Snapp scored 22 points for UU. Datrey Long added 15 points and Malik Jacobs chipped in 10 points and 7 rebounds. A trio of Fairmont’s players hit the 20-point mark, with Vonte Montgomery leading the way with 23 points and 11 rebounds. Andrew Emrick scored 21 and Jason Jolly had 20. UU (5-14, 3-12) hosts Shepherd on Saturday at 4 p.m.
https://www.urbanacitizen.com/wp-content/uploads/sites/36/2019/02/web1_Sa-DeraJohnson020719.jpgUrbana University’s Sa’Dera Johnson (3) probes the defense for an opening against Fairmont State on Thursday.